#bedtimestories is a feature in which people reminisce about their favourite work of children’s literature they read or had read to them as a child and why it remains so important to them today. We could go on about it a bit more but that’s about it really. What were your favourite bedtime stories? Let us know in the comment section below. So this choice of bedtime story may, potentially, possibly seem just a teeny tiny bit ‘me me me’. Perhaps. But hey, Eloise would approve of that. She’s a ‘me me me’ kind of girl – the kind of girl who scuffs her heels along corridor sideboards, who would rather do handstands than homework, will turn anything into a hat and orders “one raisin and seven spoons” from room service. She is a wild, impolite, spoilt brat, with unbrushed hair. But hey, she’s got oodles of self-confidence, heaps of imagination and a twenty-twenty eye for fun. She also has a pet turtle called Skipperdee, if you needed any more convincing that Eloise is exactly the kind of girl the six year old you wanted to be, or at least spend an afternoon with. Of course, everyone is naturally drawn to their namesakes. It is hard not to try and pull out some part of a character that resembles you, or that you want to resemble, when they are prancing around with a part of your identity. This is an especially strong feeling when you’re a kid, when sharing things is not always exactly a first instinct. It’s bad enough having siblings sharing your parents’ attention and your DNA, but having someone out there claiming your name for themselves can feel like losing at your very favourite game, with everyone watching. Yet, the Eloise from across the pond and I never had any kind of sibling rivalry. Even if she was more popular than me and her mum knew Coco Chanel. Even if she had an entire hotel on hand for escapades (the Plaza hotel no less). And even if she looked infinitely more chic with a cabbage leaf on her head than I did. Because she was absolutely fun fun fun and most certainly would never lose at any game, even if you suspected the game may have changed somewhere along the line. Eloise’s favourite thing to do is make things up. She can turn a bath into a pirate ambush and she can turn baguettes into skis. She can turn flicking through a book for the hundredth time into an adventure. Okay, maybe in real life Eloise is a terribly indulged, obnoxious, bratty little girl, with absent parents and servants who pander to her every whim. She is stubborn and attention seeking and thinks that pouring a pitcher of water down the mail chute is completely acceptable. But hey, when you’re a six year old that can’t treat the Plaza as your personal playground, and you’re much more of a goody two shoes than a mischievous scamp, she’s everything you want to be able to turn into. When you begin to think that you can’t have everything your own way and that repeating everything your teachers say might not work out for you and that sometimes, in public at least, running and dancing and skibbling and doing handstands isn’t appropriate, Eloise is the naughty, headstrong, almost-doppelganger everyone needs. Eloise has Inner Reserve and when you are feeling distinctly lacking in that department, she’s got your back. And probably some mad brained scheme and bottle caps hidden behind her knees (“no one looks there on a child”). Eloise doesn’t care about being labelled bossy. She never lets herself be bored. She always says what’s in her head, because at six years old she already knows that makes everything so much easier. And she may “not yet be pretty, but she is already a Person”, which means that, even with the occasional temper tantrum, she’s still doing a whole lot better than me. I am Eloise, I am twenty. I am hands down nowhere near being a grown up. And sometimes I daydream about pouring pitchers of water down the library return chutes. I read this article and found it very interesting, thought it might be something for you. 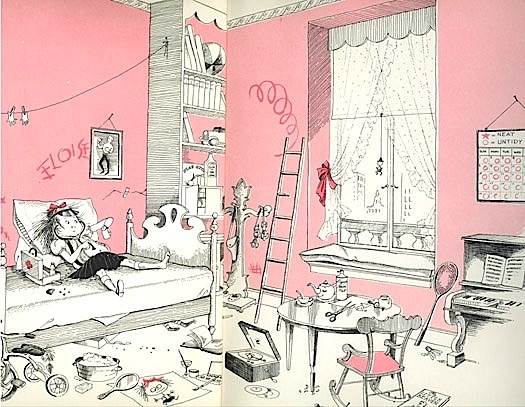 The article is called Eloise – #bedtimestories and is located at http://prancingthroughlife.com/2014/03/19/eloise-bedtimestories/.